Accepted into the UNESCO Tentative List of World Heritage in 2014, the ancient city of Anavarza in southern Turkey's Adana province offers visitors the chance to travel through time with its millennia-old structures and relics. Speaking to Anadolu Agency, Provincial Director of Culture and Tourism Sabri Tari said more tourist amenities are being built to better serve visitors. Situated in Adana's Kozan district, the city, established by the Roman Empire, is considered to be one of the biggest ancient cities in terms land area. The ruins of several structures – including a castle, stadium, church, theater and a bath – remain at the site. Since excavations at the site began in 2014, researchers have discovered limestone statues of the Greek goddess Hygieia and god Eros along with several mosaics and relics. The city also features the world's first and oldest street, a 2,700-meter-long and 34-meter-wide road decorated with 1.5-meter-high columns. 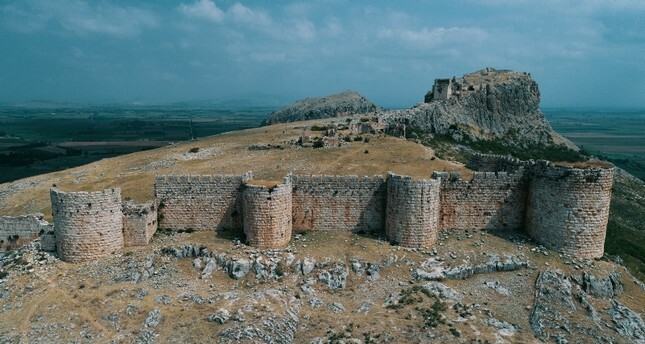 The Anavarza castle sits on top of a central hill in the area, overlooking the vast and fertile Çukurova plain once known as Cilicia, and is regarded to be among the most important ancient castles in Turkey. Expressing the wish to extend the excavation works to the Anavarza castle and start restoration works as soon as possible, Tari said the process for submitting an application to UNESCO World Heritage List was underway. Tari explained that Anavarza earned the nickname "the invincible city" after emerging victorious from all of the battles it fought in. Established by Emperor Augustus in 19 B.C., the city was used as an important military outpost during the Roman Empire. According to historical records, the city of Anavarza reached a population of 100,000 at its peak during the fourth century.